Is It True That Google Plus Activity Has No Search Ranking Benefit? “Does having a strong presence on Google+ affects your presence on Google as a whole? Or more precisely, does it have any direct impact on Google’s search rankings? “. This is one for the debates, as people often dispute it, essentially because the Google Plus share link is a dofollow link, which means it passes PageRank. But as Google's Matt Cutts told us time and time again, Google Plus activity might not actually give you any search ranking benefit, as suggested by one latest study by Eric Enge, co-author of The Art of SEO and a speaker at SES SF 2013. The study by Enge, named Direct Measurement of Google Plus Impact on Search Rankings, draws attention to a surprisingly shocking result. 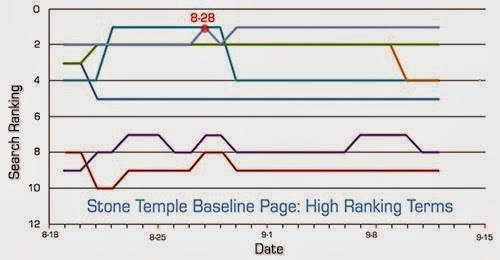 It shows that Google+ has no direct impact on your Google rankings. Google+ can increase visibility of your post, which ultimately leads to more traffic,, but then again, Facebook or Twitter can do the same as well. Stone Temple Consulting took three different websites that were on the internet for the past two years. Two articles were written for each website. One of the article pages was used as the “Test Page”, and the other was used as the “Baseline Page”. Both pages were standalone, and were implemented without any links to them from any source. Both of them received an initial set of Google+ Shares, 6 for the Test Pages, and 40 or more for the Baseline Pages. A group of Google+ influencers (Those who have large no of following) shared the Test page. The participants were also instructed to only share the page, not to link or visit the page, unless absolutely necessary. The pages were tracked from the end of July 2013 to September 15, 2013. All pages were monitored to verify that no links were implemented to the pages. Tools used to monitor links were Webmaster Tools, Majestic SEO, Open Site Explorer, and Ahrefs. To see if Google Plus would drive discovery. Does Google Plus drive page indexing? Whether Google Plus shares have an impact on page ranking. "In my opinion, it is highly likely that Google+ drove discovery of the content." While this does not say they will index it, or rank it, it does say that they reserve the right to crawl it, and it was important enough for them to explicitly state that they might do so. And it all makes sense too. The study revealed that it took Google Bot only 6 minutes to find the pages after the first Google Plus share. During analysis, Enge found that Google+ shares probably drive indexing. All the six articles (2 articles, on each of the 3 test pages) initially appeared in the Google index 10 days later. "We saw no evidence of Google+ shares driving ranking," Enge said. "Once we saw that a page was indexed, we were immediately able to find search queries for which the page ranked. However, this does not mean that the shares were driving ranking. As per the original Sergey Brin - Larry Page thesis, each page on the web has a small amount of innate PageRank. This PageRank by itself might cause a page to rank for certain types of long tail queries, even in the absence of any other signals." 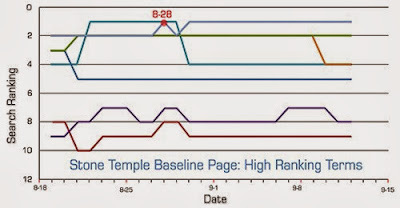 You can see from the above graphs that rankings have no specific pattern. Google+ shares probably drive indexing as well. No evidence of ‘Google+ shares driving ranking’ was found. Good morning friends. thank you for your generosity to share. I was one of the bloggers who use google+ search visitors, and is very evident. Google+ now able to compete with other social media such as facebook and twitter. Thanks to share nice topic. Google Plus is a new platform and most of people like me don't know about it. Your post helped me a lot. Hi Qasim brother, One of the best site i have reached. With this all guidance, its really fantastic posts. Thanks for your updates today. G+ might be a tool for us to visible in Web. No matter if it will affect or not our ranking, the most important thing is we are able to share our ideas with others.Thanks for this wonderful info! More power to MBT!!!! I was one of the bloggers who use google+ search visitors, and is very evident. Google+ now able to compete with other social media such as facebook and twitter.